By Rebecca Nickols on November 14, 2011 Visit Rebecca's Website. 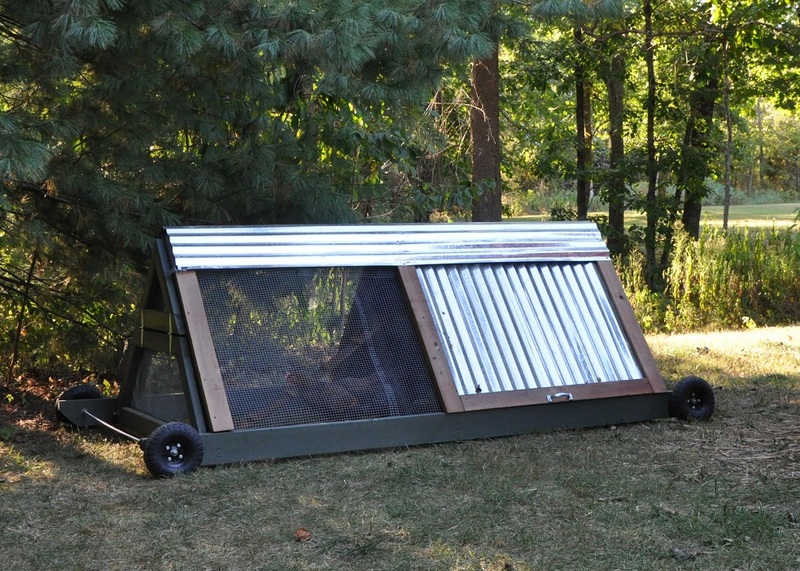 The purpose of a chicken tractor is simple: It’s movable, it lacks a floor (which allows the chickens to forage and scratch), it provides shelter and protection from the weather and predators, and it has a separate nesting area. Jeff chose to build an A-frame design, which he originally intended to be more of a chicken “sled.” The plan was that I could easily pull or slide the tractor, but when he had completed the frame it took both of us pulling, pushing and lifting to move it even a short distance. 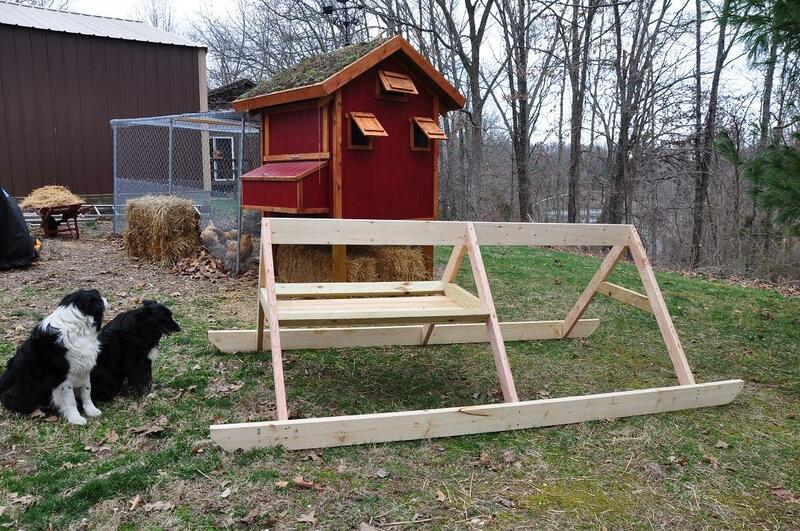 The “sled” then became a “tractor” when he added wheels to the front and back of the portable coop. It’s still a little hard for me to maneuver over our rocky/hilly soil, but it’s doable and I’ve put the tractor to use in a variety of ways. When he first completed the tractor in the spring I used it as a nursery for my new chicks. This was the perfect setup for introducing the younger birds to the older hens. They could see each other (and get to know each other), but the little pullets were separated and protected from the older birds chasing and pecking them. This fall I finally started using the chicken tractor for what I originally dreamed of and it couldn’t have come at a better time. Not only is the tractor a great way to weed and fertilize the garden beds, it’s also given me some peace of mind knowing that my chickens aren’t roaming too far. Since I started letting my flock free-range earlier in the summer, they have became braver and more adventurous in their foraging. Last week I found them acres away from the coop–exploring the neighbor’s garden! I’m afraid that in addition to the common chicken predators (foxes, raccoons, hawks), I now need to add the neighborhood dogs, cats and maybe even the neighbors (if they destroy their gardens)! I think that I’m the perfect picture of a chicken-keeper who loves her chickens. I’ve handled them since they were a day old, I feed them treats routinely, they’re overly protected from predators, and they have 5-star accommodations. You would think that they would have the utmost trust in me and allow me to handle or hold them, but that’s not the case. Athena, my Golden-Laced Wyandotte, is convinced that I want to eat her and she has somewhat of an influence over the rest of the flock. I think she must have told them that chicken tractor was a dangerous, evil place, because they all became terrified of going anywhere near my portable coop. When I did get a few chickens in the tractor, they freaked out–perhaps because they were separated or maybe because they were confined in this scary place. I gave up on forcing them (because it wasn’t working) and started leaving the tractor door open and sprinkling the ground with their favorite treat–meal worms. It only took a few days before they realized that the tractor wasn’t the doomsday coop they had envisioned. Now it only takes me a few minutes to transport the chickens from their run to the tractor! The inside of the tractor is pretty simple: There’s a ramp that leads to the “loft” area that includes one wooden nesting box. I also include a small container of chicken feed and water. It’s not set up as a predator-proof chicken tractor, and once the sun starts to set I transport them back into their secure coop. I had noticed when I first started keeping them in the tractor that the moment I let them out a couple of girls would quickly run back into their home-coop and lay an egg in record time. I think they had been holding it in for hours! I guess they didn’t think the nesting area in the tractor was an acceptable place to lay an egg. 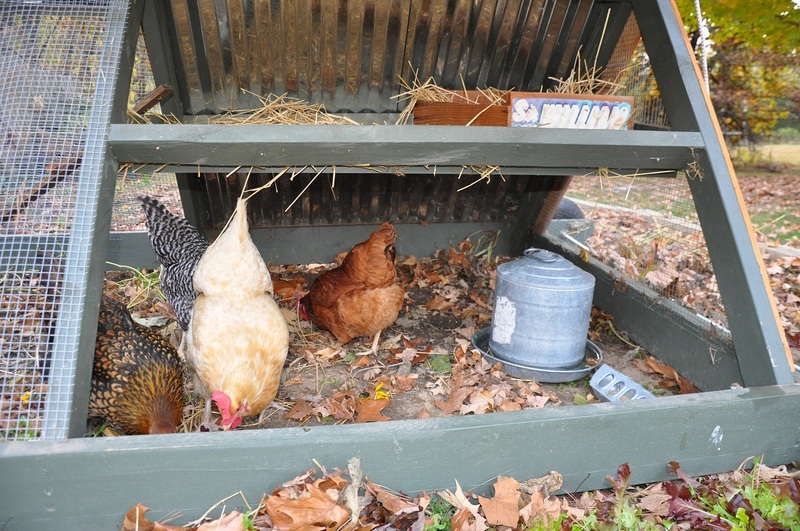 I solved this dilemma by simply placing a couple of eggs in the nesting box and they eventually figured it out. One thing that I love about using the tractor is the fact that I can control where and what the chickens eat. When they are truly free-ranging, they are on the move constantly. They would never dream of eating the weeds out of my vegetable garden when they can hunt down worms, bugs or grubs, but when weeds are all that’s available–they’ll eat them! The “fertilizer” they deposit needs to have a few months to age before I plant my spring crops, so I plan on moving the tractor out of the vegetable garden sometime around January. Then I’ll just move it in different spots around the yard. I still let the flock free-range around our property (if I’m outside and can periodically check on them), but the chicken tractor has proven to be everything I dreamed it would be! 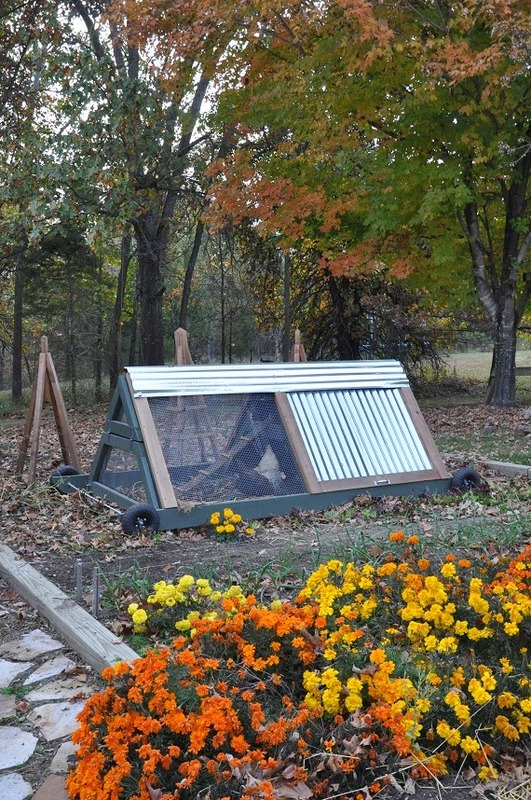 Share photos of your chicken tractor on our Facebook page! Frankly, I haven’t come up with any way to keep them out other than just killing them. I have a frenid near here who would catch them and release them far from his place. Eventually they would find their way back over there (he noted some scars or other markings on the snake that he moved, so he knows it was the same one).Fortunately, we haven’t had a problem with them recently (as far as I know, anyway). I’m surprised that they swallowed the golf ball. I had always heard that they could tell that it wasn’t a real egg. The only solution I heard to that is to blow an egg and then carefully fill it with plaster of paris or some other material. The snake would be fooled by the egg shell, then the egg would kill it.All the chickens I have now are Heavy breed birds, so the snakes don’t try to bother them. On the other hand, I have 10 chicks that are about a week old (I really need to post photos! ), and they would certainly be a tempting target. Where they are, a snake could easily get to them.If you have photos, I’d sure like to post them. if you don’t mind. You can send them as an attachment to and I’ll post them (and, of course, include photo credit to you). Brilliant! 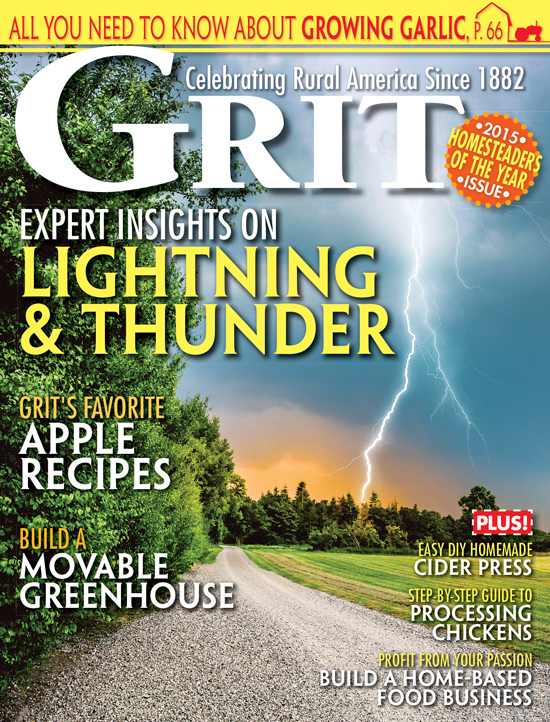 Your cogent insights are a pleasure to read. Thanks for sharing. I have a large (4′ X 8″ X 4″) tractor that I got for Christmas last year! It is on wheels with handles and maneuvers like a wheel barrel. I move it every few days for free ranging with safety from our coyote/fox/raccoon/hawk/dog populated property. It is where the newest flock lives until the newer flock comes in and they move into the barn coop with the older girls who are on their third year of laying and about to become dinner! I keep about 3 flocks of 5 at a time. This keeps my interest in trying different breeds. They are all so pretty and unique and I always want one of each!!! When our chicks were old enough to go out(June) we put them in our tractor. It is heavy and has wheels so is a little difficult to move. This week we moved the chickens to the coop (we just finished it) and they were a bit scared at first. the run is under neath it and have loaded it with the fall leaves and they are loving that. we will be adding fencing for a side run to the coop. Saving the tractor for spring. Just need to rig up a couple of harnesses inside so the chooks can perambulate up and down at will! 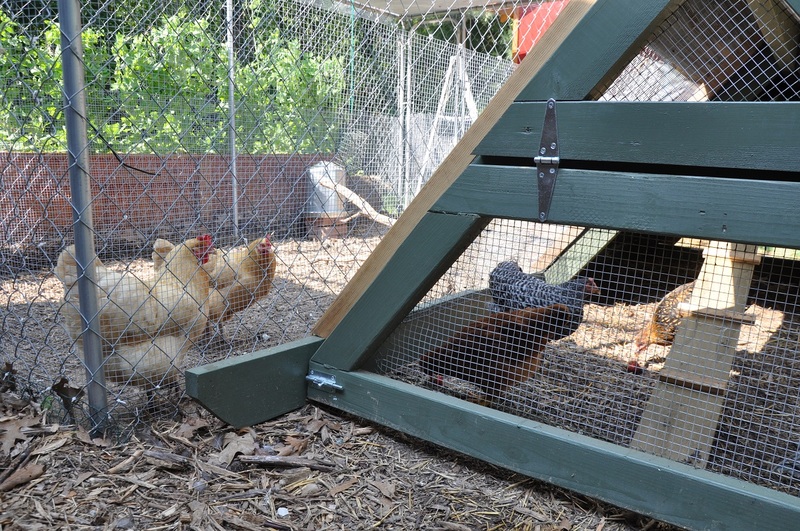 I have a similar set up for my new chicks (minus the wheels) and have the same issue with trust from the young birds. Now they’re getting a bit big for it it’s back to the workshop for another coop making festival.